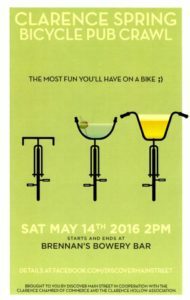 Don’t miss the Clarence Spring Bicycle Pub Crawl – coming to Main Street on Saturday, May 14th. Brennan’s will be serving up $5 Flying Bison Rusty Chain all day. Drag those bikes out of storage and pedal your way to Brennan’s!